Yesterday, I read a thought-provoking story that I think you’ll also find to be at least curious. I read about this wealthy businessman who was really into Jesus, having been heavily influenced in very transforming ways by a pastor whom he greatly admired. This particular pastor only briefly passed through the businessman’s life, but his impact was revolutionary. Subsequently, this businessman began to treat his employees with more grace and generosity. But here was the rub, one of his employees severely ripped him off and then went missing. After several months, the wealthy man received an email from the distant pastor that he’d accidently bumped into the rogue employee and the thief had repented and decided to give his life over to Jesus’ leadership. The pastor was sending the thief back to the businessman! In the email, the pastor put the squeeze on the businessman, requesting him to do two things: forgive the thief & then let him go back to the pastor to help in his pastoring work. Clearly, the businessman was in a quandary. Justice said that the thief should pay for his crime, but grace said that the businessman should forgive his fellow brother in Christ. When I read this story, there was a totally riveting sentence that keeps echoing in my thoughts. In the email, the pastor told the businessman that the former employee was useless as an employee, but now he was altogether useful as a fellow member in Jesus’ family: useless as an employee, but useful as a brother. Seems to me that we often determine the value of a person on their function rather than their relationship with Jesus. This story is my paraphrase of the story of Philemon in the Bible – a super short epistle from Paul to Philemon, the businessman. Philemon had a slave, Onesimus, who stole from him and ran away, only to bump into Paul, who helped Onesimus become a follower of Jesus. Upon returning Onesimus to his former owner, Philemon, Paul placed the supreme value on Onesimus being a fellow brother in Christ & made his position as a slave a virtual disposable value. There’s a homeless guy that hangs around my coffee shop & if you just took a quick look at him, you’d think that he’s insane. He looks kind of gruff, unshaven, sometimes not so clean & generally unkempt. As I get to know him, he’s less and less scary to me – in fact, I think he’s quite gentle and polite. Some people probably think that he needs to be committed somewhere. a committed relationship with Jesus infuses our daily living, helping us to forgive, make right choices, think right thoughts, become more mature & effective and Jesus helps us love better & more everyday. ever been mad at God? In my opinion, a relationship that has any degree of depth needs to be able to work through conflict, tension, disappointment, misunderstandings, challenges, etc. I sincerely believe that the deeper the relationship, the more we must be willing to work through such struggles & I don’t think that our relationship with God is any different. I think that our relationship with God is as deep as we are willing to wrestle: no wrestling, shallow depth; much wrestling, much depth. My examples for this thinking are in Job & Jacob who strenuously wrestled with God, not without some impairment. I’ve been thinking about love alot lately, so I’ve tried to take a genuine look at what God says about what love & is not in 1Cor 13:4-8. Basically, Paul breaks down love into 2 categories: what love is & does versus what love is not. Simply put, love is / does not: jealous, arrogant, brag, act unbecomingly, provoked, self-serving, rejoice w unrighteousness or keep track of wrongs. Furthermore, love is / does: patient, kind, rejoice w truth, bears all, believes all, hopes all, endures all & never fails. Take the above lists of love is & love is not & slowly think through each description as you relate the word to your relationship between you and God. So for example, when I think about loving God, I’m not jealous of God, I don’t want to be arrogant with him nor would I be expressing genuine love to Him when I boast to Him. Additionally, when I love God I don’t behave unbecomingly with Him nor do I want to provoke Him. Here’s the tricky one for me – as I love God, I don’t want to only relate to Him for what I can get out of Him (self-serving). On the positive side, when I love God, I’m patient & kind with Him. I also rejoice when truth is done because I know that He is on the side of truth. When I love God, I bear all things with Him, believe the best with Him, endure with Him when I don’t understand or agree and always keep my hope in Him. I just finished a very powerful book – Three Cups of Tea (Jolene loaned it to me). Gees, what a read. I’m still reeling from it & I’ve kind of dreamt about it over the last few nights. This is a true life story about a guy who builds schools in VERY rural areas of Pakistan & Afghanistan, over the last 15 or so years. His goal is to promote peace through building schools. Some of the things that keep knocking me sideways are his findings about the importance of educating girls – lowering infant mortality rates, improving clean water usage & overall hygiene improvements, thereby improving quality of life, among many other things. 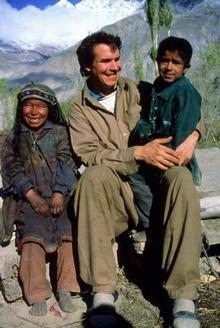 The guy who does this, Greg Mortenson, isn’t some high power, sophisticated, ultra shiney & socially connected guy. From the book, it sounds like he’s more comfy chillin in a rural Pakistani village than snuggling up w American comforts & social imperatives. He’s made a MASSIVE difference – what a motivator. Reading this book really pushes my heart into God to follow His lead in this life to make a difference.